A Layou butcher is threatening legal action against the Milton Cato Memorial Hospital (MCMH) for what he says is negligence, disrespect and unprofessionalism of the highest order. 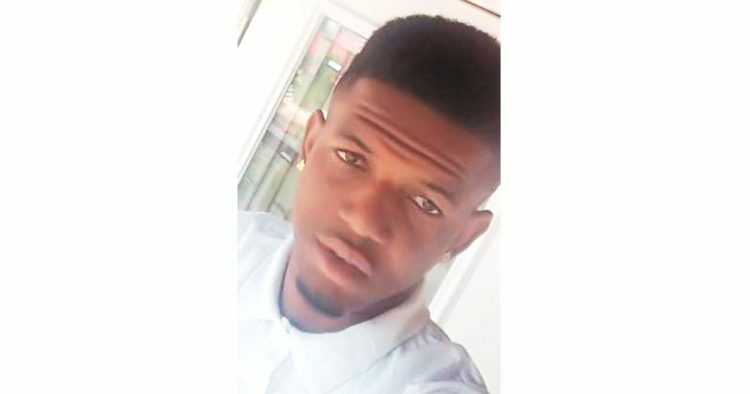 The man, 21-year-old Najee Burkley, was rushed to the MCMH’s Accident and Emergency (A&E) Department on Tuesday March 12 sometime after 2 p.m. after he severed his right index finger while cutting goat meat at his workplace, Massy stores. Burkley said he was using an electric saw and at first, he did not realize his finger had been severed and only saw the damage after he picked up another piece of meat to cut. He said his finger was not bleeding at first because the room was extremely cold and after the damage was realized he was rushed to the MCMH where a nurse looked at his injuries sometime after 2 p.m. He said his severed finger was placed in a transparent container filled with liquid and he was asked to wait to see the doctor. Burkley said he was told by the nurse that his finger was placed in the liquid to keep the nerves alive so that his finger could be reattached. He said that around 4 p.m., he still had not seen a doctor and when he inquired, he was told there was only one doctor and he was busy filling out cards. As Burkley waited in pain, he said his hand started bleeding again and he inquired again when he would be able to see the doctor. “The nurse take off the bandage and they clean it and tell me I will see Dr Woods at the Male Surgical ward the next day,” Burkley related. He added that when he returned to the hospital the following day, he saw a doctor who told him that he needed surgery, but the MCMH could not do the surgery. Burkley said he was told to go to Arnos Vale at a clinic located above the Ace building for the surgery and when he asked if he should bring the severed finger, he was told yes. He said he told the safety officer at Massy stores about the surgery and they went to the MCMH to retrieve the severed finger, but he was told by a nurse that they could not locate the finger. Burkley said he then went in search of the head nurse at the facility to file a report, but was told that she had gone to Georgetown, but he filed the report anyway. He did surgery and now he is without his finger. “I feel bad about it because I wanted my finger. My aunty dealing with a lawyer,” said Burkley. He added that persons are telling him that his finger could not have been reattached because the MCMH lacks the facilities for such a complicated operation, but he says that is not what he was told initially. “In the first place, they should not have asked me if I want it to go back on. They should have tell me one time it can’t go back on and I would understand that, but they tell me they will put it back on, so they put it in liquid,” Burkley said. He said he feels odd without his finger and while the loss of his finger may not stop him from working, it may stop him from using the electric saw at work because the saw is designed for right handed persons. A local medical professional however said in response to the incident that total amputations of the digits cannot be reattached here. “This requires microsurgical techniques and instrumentation which are not available here nor in many facilities regionally,” said the doctor. He added that a patient with a total amputation is started on antibiotics and sent to clinic to schedule for reconstruction of the finger stump, which is usually done later to diminish infection risk. “Reattachment is not an available option in St Vincent and would not have been discussed. If reattachment of a digit were possible, it has to be done within four hours and so a patient would not have been sent to find his finger the day after, as it would already be non-viable at this time,” the doctor explained. The doctor added also that at the MCMH, a non-viable amputated digit would have been discarded unless other instructions were received, and it appears this case is a misunderstanding of these facts. When contacted, Permanent Secretary in the Ministry of Health Cuthbert Knights said that he was not able to comment on the incident as he had not yet received a report on the matter.